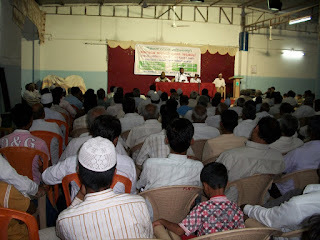 The second day of the Qur`aan Pravachan, overwhelming response was found. People especailly our non Muslim brothers were present well before the start of the programme. About 250 people including women attended, 80% of them were non Muslim brothers and sisters. The topic of the day was Pravaditva (The Prophethood). 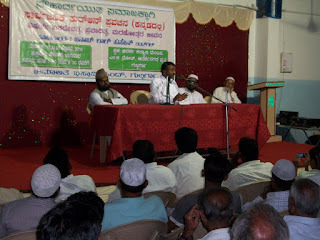 Jb Laal Hussain Kandgal gave the pravachan and enlightened the audiance about the concept of Prophrthood in Islam. He said the mankind was newer deprived of the devine guidance. For the the creator sent a number of messengers to guise the humanity. The first human whome islam calls Hazrat Adam(A) himself was a prophet. From then onwards more than Lakh prohets have been sent by the alimghty Allah. The prophets guided the humanity towards the path of righteuos, tought them about the purpose of life and brought about revolutionery changes in the men and women who once were completly ignorant about the modesty and value and purpose of life. Prophets saves the downtrodden from the clutches of slavery and made them to live the life of independance with coplete obediance to the Almighty. The Prophet Mohammaed PBUH was the last prophet sent by the Almighty on whome the holy Quran was revealed. Thus the pravachan was delivered for about 70 minutes, the people listened to it with pin drop silence with occasional clappings for the heartning words.